It was our 30th wedding anniversary this week so I decided to make us both a card. Since the symbol for 30th is pearl I decided on pearlised card for the base. The heart hangs out over the edge and fits into the negative shape on the other side. This was the point I decided the card was too plain. It was too late to dry emboss so I decided to heat emboss it using a pearlised powder. It barely shows up in the photo, it looks much better in reality. The small heart was a die cut and it’s boarder was hand cut by tracing around the die. 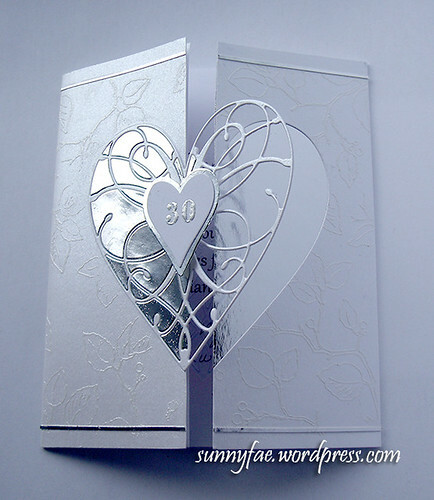 I really like this card but if I had thought it through I would have embossed it before I’d cut the hearts out. Doing it this way involved lots of masking and more care with the heat gun. It really doesn’t feel like thirty years since we married, I suppose time does really fly when you’re having fun. This is a quick card made with things I had to hand at the time. The backing paper was something I had made in the computer just laying circles on top of each other. It was a remnant from something else and kind of looked like the bokeh effect photo’s I have been taking lately. 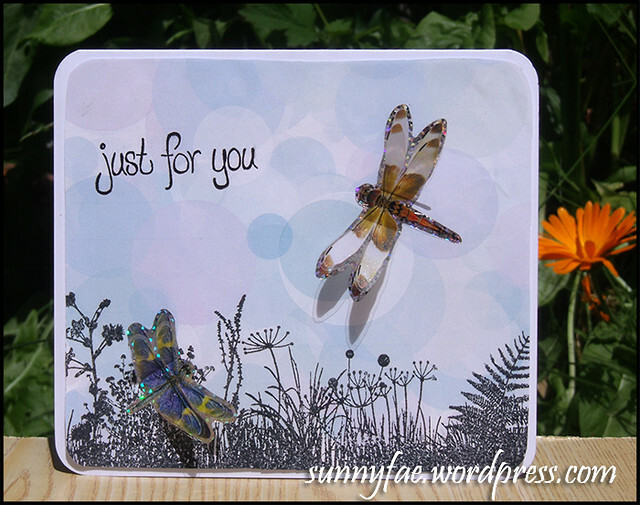 I used a border stamp from Indigoblu along the bottom, a small sentiment stamp and some self adhesive dragonflies from my stash. Quick, simple and effective. Sometines that’s all you need. Hello. How’s it all going. The sun is shining and all is right with the world. Then it rained. Everything is still ok, just wetter. I was looking through my stash for something to make for a boys card. It’s hard to know which way to go for boys. You don’t want to be too cutesy and you try not to be too boring. I found my steampunkery stamps and thought mmm, I love the stamps the way they are but really I just wanted to use the wings. 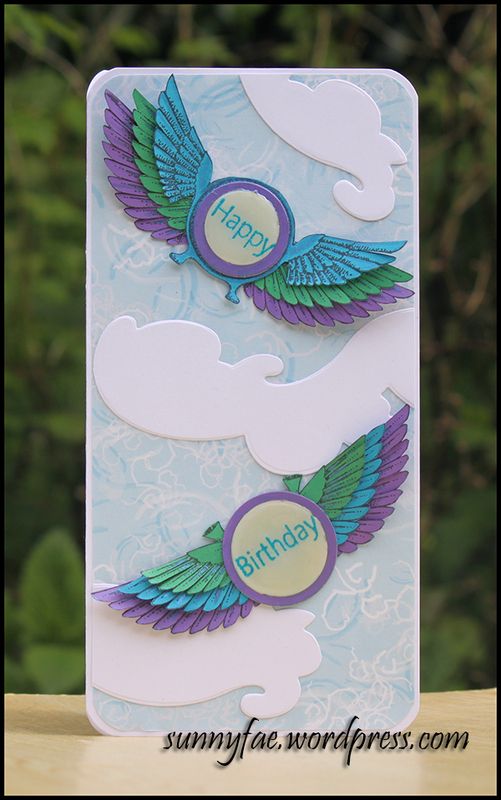 The flying “bugs” were made by stamping about five times onto coloured card, cut them out and trim between each feather to give a little more movement. The bottom of the green set were cut off and were large enough to be placed between the other set of wings. 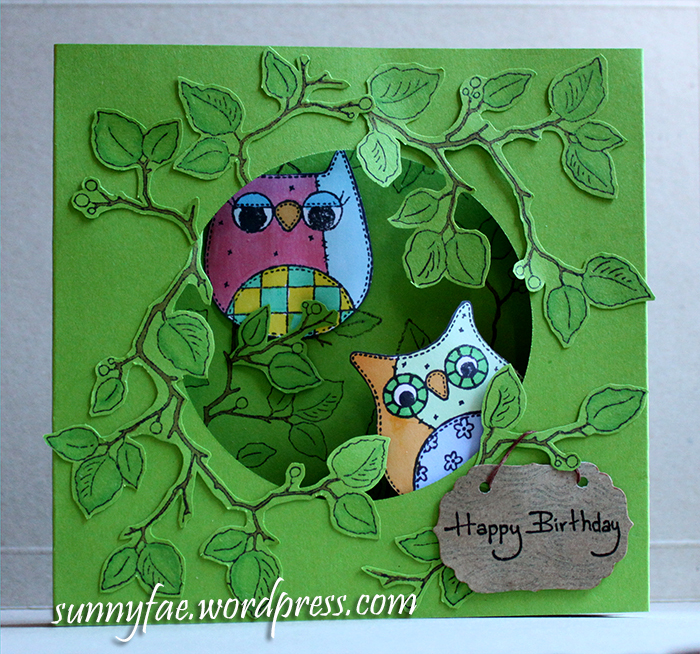 Happy Birthday was stamped out onto two circles of card and a narrow frame of card placed on top. It was then filled in with glossy accents. 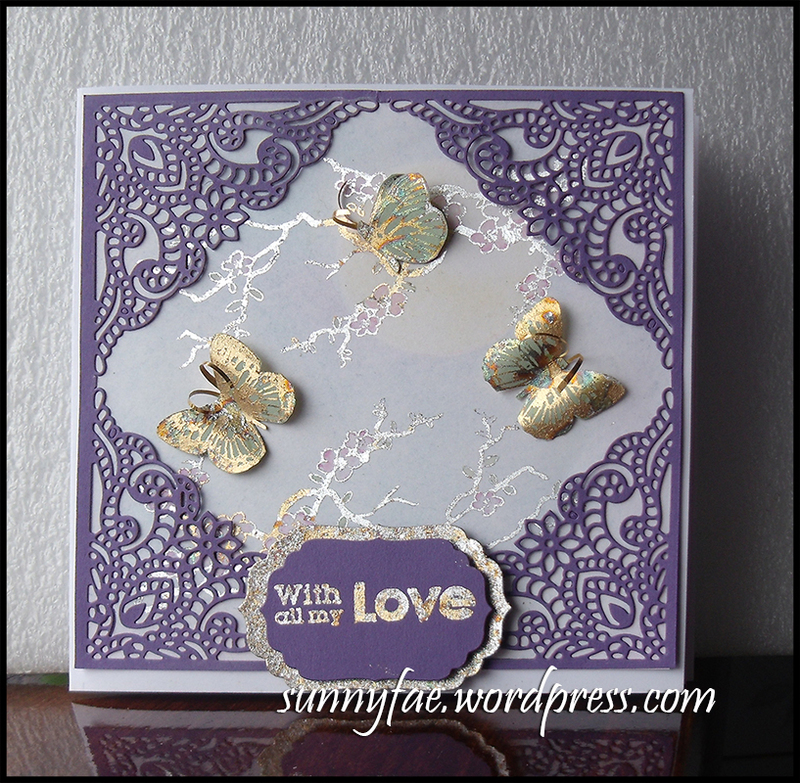 The clouds were made with the outer layers of Sue Wilson’s Gemini Dies – Lyra. When you cut them together without the inside flourish they look like stylised clouds. The background is something made up in Photoshop with various squiggle brushes. I just wanted something simple and random. I’ve used the beetle stamp so many times (for examples see here and here ) it’s always nice to find different uses and styles for them. Even though it’s a steam punky set I don’t always want to be stuck using dark colours, I like that this card has a light and airy feel about it. That’s me for today. Thanks taking the time and stopping by. Till next time, have fun x.
Hi there, how are you. My daughter and I have decided we have too much stuff so we are using up what we have till it’s gone. This is to use up the vast amounts of stuff we have. I found a pack of vellum amongst my stuff so I decided to have a go.I’ve never used vellum before, I bought it because I thought it looked cool (something I have to stop doing). After trying a few things (and failing) I decided to start simple and stamp onto it using distress ink. This worked surprisingly well considering it’s dye based ink, and it didn’t smear all over the place once it had dried. 2) I had messed it up testing things out so I decide to put a frame around the parts I could use. The pink paper for the main frame was embossed with an embossing folder one side at a time because the folder was a lot smaller than the paper and a circle was cut from the middle. To pick out the pattern I lightly rolled over it with a brayer and some Versamark, sprinkled on some embossing powder and heated it with a heat gun. 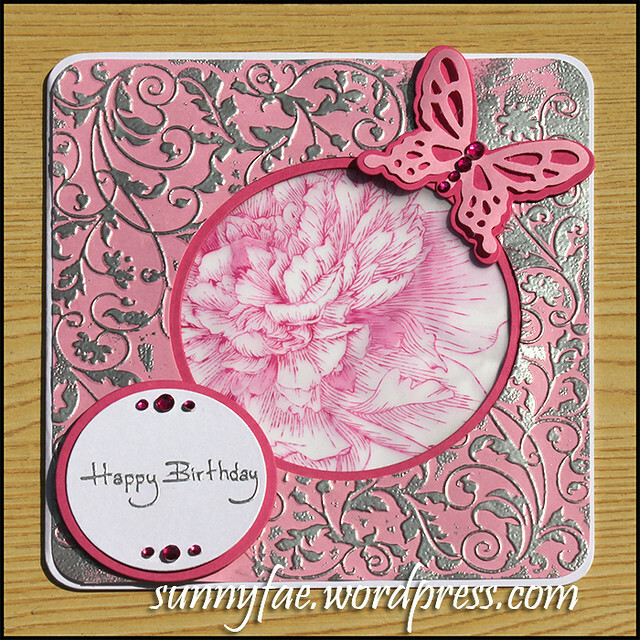 I’ve used a darker pink card around the sentiment butterfly and centre border to help everything stand out. The corners of the card were rounded. Everything here was a huge experiment so it was nice to get a decent card at the end. Hi there how are you. It’s spring! Yes yes it is, the sun came out and the gardening began. I say gardening but what I really mean is tidying up, cleaning out the old pots and stuff. Planting a few herbs. Then I remembered that last summer as the days got shorter and the seed heads dried out that what I really needed was some little seed packets to save them in. I did make some but they were very crude, serviceable yes but not too pretty. I found a book of templates (Folding Ideas for cards & envelopes) inside there was a card with an attached envelope for gift cards.The perfect size. The book has a CD in the back with all the templates from the book so I put the one I wanted onto the computer. It was the right sized envelope but the opening was on the wrong side and it needed a little adjustment. I now had two templates and they both fitted onto an A4 sized page so I printed them both off. 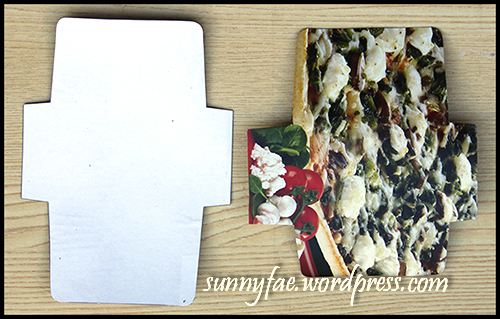 For strength I glued the copy paper down onto cardboard (an old pizza box) with PVA glue, They’re quite sturdy. I drew around them cut them out and folded them up. As you can see in the top picture I have tried several closings and I think it depends on how they are folded as to which style suits the best. For the seed packets I’ll maybe go for two buttons. The first envelopes I made were made out of copy paper, old wrapping paper and scraps, decorated with whatever was on my desk at the time.They are far too pretty for seed packets so I’ll be using these for birthday gift cards maybe and make planer envelopes for my seeds. Hi there. Happy Mothers Day. For Christmas this year I was given some gilding flakes. I’ve not used them before so it has been a bit of a learning curve. The first efforts didn’t work too well because I think I was being a bit stingy with the glue. This meant the stamps got stuck to the paper and sometimes there wasn’t enough glue to hold the flakes on at all. This is my second go and it went a lot more smoothly this time. I stamped the cherry blossom, butterflies and sentiment in glue. (The glue doesn’t dry as such, it just gets really sticky and stays sticky for a long time). Place flakes into glue and press and rub firmly with fingers so the flakes make good contact with the glue. Rub gently with a “scoochie” (spongy scrubber). This takes all the bits of flakes not in contact with glue away from the card. You need a tub of water on hand to put the stamps in as you’re doing this or the glue gets stuck onto the stamps. It comes off very easily when wet, not so easily when left to dry. Then you have to use a special stamp cleaner to get it off. It’s much easier to put them in water as you go. You can barely see it in the picture but there was some ink blending on the card and the blossoms were tinted with water colour paints. The frame is made from a corner die that was free with a magazine. It was cut four times, one in each corner and the waste in the middle snipped out with scissors. When I assembled the card I wanted the sentiment to stand out a bit more so I cut another shape the next size up and went around the edges with the glue. There were lots of tiny bits of flake left in my tub so I picked them up with the glued card and pressed them down. (It’s a good way to use all the dusty little bits up). Hi there. It’s spring and I need a rest from winter so today I have been playing with nice bright colours and you can’t get much more Spring like than yellow and green. It’s pretty simple really, a die cut tag blnded with yellow ink and stamped with green swirls. 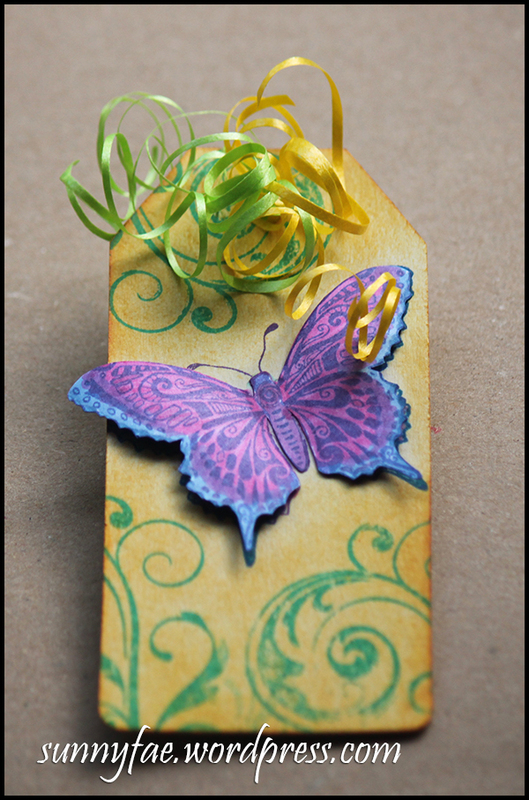 A butterfly was stamped twice, first directly onto the tag and again on to some white card. They were both coloured with alcohol markers. The second butterfly was cut out, shaped over a pen barrel and glued down directly over the first stamped butterfly. I found some curly ribbon in my box that matched the colours just to finish it off. I seem to be running on a theme of owls and leaves. This card was actually the first of the run, the second one here. It’s interesting to see the different styles of card that can be made with similar supplies. The leaves were stamped onto two separate pieces of green card. One for the inside back the other for the front. The owls were stamped onto some scrap white card. They were all coloured with alcohol markers and cut out. The alcohol markers did seep through to the pack of the card so I cut out a small square of pale green paper and adhered it to the back covering up the staining and giving me some where to write a small message. I cut a circle out of another piece of green card for the aperture at the front and made a shallow box shape. The box had concertina sides to enable it to fold flat and fit inside an envelope. This makes it easier to post. I stamped Happy Birthday onto a scrap of paper that had some sort of wood grain effect on it, cut it out with a small die and hung it with some thread from one of the leaves as everything was glued into place.